The North East Hampshire group of the Ramblers Association is based in the Farnborough, Aldershot and Fleet area and is the local group of the Hampshire area of the Ramblers Association covering Rushmoor and Hart districts. Walks are open to all members of the Ramblers Association. The group now has over 200 members. A regular programme of walks is held in the local area and also further afield. Walks are held at weekends, on both Saturdays and Sundays. During the summer, short evening walks are also held in the local area. Both short walks (half day) and longer walks (full day) are offered. The club also does long distance walks, which have included the St Swithun's Way, The Thames Path, the Surrey Hills Challenge and the Brenda Parker Way, established in memory of Brenda Parker, one of the founders of the group. The current programme of walks is attached in pdf format (easy for printing). The group has an active social programme, particularly centred around the annual group walking holiday, the October weekend. The 2007 weekend was held on the Isle of Wight and the 2008 weekend was held around Hereford. The 2009 weekend was in Kendal, in the Lake District, and the 2010 weekend in the West Mendips. The 2011 October weekend was in the Eastbourne area. The 2012 weekend was in Shropshire and the 2013 weekend was in Upper Teesdale in the High Pennines, staying at Middleton in Teesdale, Co Durham. The 2014 October weekend was held in the Cotswolds and the 2015 weekend was in Newquay, Cornwall. The 2016 October weekend was in Cardigan and the 2017 one was in the Isle of Wight (see pictures below, which were taken on Tennyson Down on the Isle Of Wight during the 2017 October weekend). 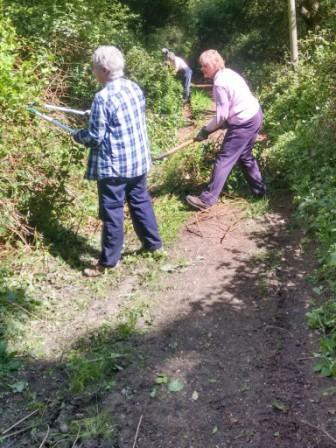 The group is active in footpath work, with representatives from the group covering every parish in Hart and Rushmoor districts. The footpaths are checked regularly and any problems are reported to Hampshire County Council. Regular meetings are held with the council to ensure that all problems are rectified. This ensures that all footpaths in our area are in good order, easy to use and well way marked. Volunteers are always needed for this work. The group is also active with practical work in conjunction with Hampshire County Council to repair bridges, stiles etc. to maintain the footpath network. Addititonal volunteers are always welcome to join the work parties. New members are always welcome. Walkers should be able to walk the distance stated in the programme and are expected to be suitably clothed and shod for walking the distance. Hampshire can be moderately hilly and muddy and new walkers are expected to be able to cope with this. Visitors from other Ramblers Association groups are always welcome to walk with us. The group are proud to be affiliated with the Walking Partnership. Help support our group by booking your walking holidays with Ramblers Walking Holidays or Adagio and nominate North East Hampshire Group when booking to ensure that we receive vital funds through the Walking Partnership. Join the Ramblers and become a member of North East Hants Group. Lovely Chilterns Walk with great views. Church Crookham to Ewshot and Farnham and back. An evening walk around Fleet Pond and the surrounding area. Headley, Broxhead and Lindford area.